K-2SO, KX-series security droid… kind of. Framed canvas giclee art print inspired by Rogue One. 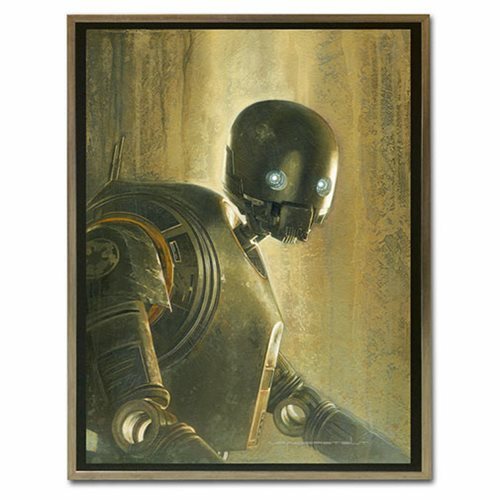 Immortalizing the key and unforgettable characters from Star Wars, the Timeless Series from Acme Archives presents this engaging Star Wars Timeless Series K-2SO by Jerry Vanderstelt Framed Canvas Giclee Art Print inspired by Rogue One: A Star Wars Story. A limited edition of 495 pieces, framed in a brushed metal float frame, it measures 15 1/2-inches tall x 12-inches wide (canvas size 14-inches x 10 1/2-inches) and includes a certificate of authenticity.